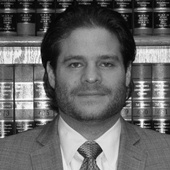 Lance H. Meyer is special outside counsel to Bashian & Papantoniou, where he primarily represents the firm’s clients’ who are going through a divorce, involved with custody related matters, child support cases and/or family offense related matters. Lance is a New York trial attorney who advocates strongly for his clients in the courts of Long Island (Nassau County and Suffolk County), Queens, Brooklyn, Manhattan, Westchester and the greater New York area. Mr. Meyer is familiar with all aspects of civil and criminal related matters, and strives to obtain successful case resolutions for all of the firm’s clients. Lance is a New York trial attorney, who counsels the firm’s clients in the division of marital assets, drafting and reviewing of pre-nuptial and post-nuptial agreements, equitable distribution, spousal support and family related offenses. Mr. Meyer is an undergraduate of New York University and obtained his juris doctorate degree at Hofstra University School of Law, on Long Island New York. His charitable work includes volunteering for both Strides Against Breast Cancer and the Ronald McDonald House.